Freezing eggs: how to preserve them when you've got too many. Freezing eggs: a solution to that summer glut. You know how it is: loads of eggs in the summer and a real slow-down in winter. If you're anything like me, you give away a lot of your flock's produce during the summer months. And then there comes a time when neighbours start saying: "Please - no more eggs!". Not that they're not grateful, just that there are soooooo many! Well, here's a possible solution for you. Freeze them. It sounds weird, but frozen eggs can be kept for up to one year in your freezer, defrosted and used in just about any recipe you can think of. There's only one caveat to this: don't use defrosted egg raw. 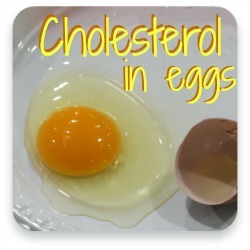 Make sure the recipe you use frozen eggs for cooks them well. If that sounds like a great idea to you - let's do it! 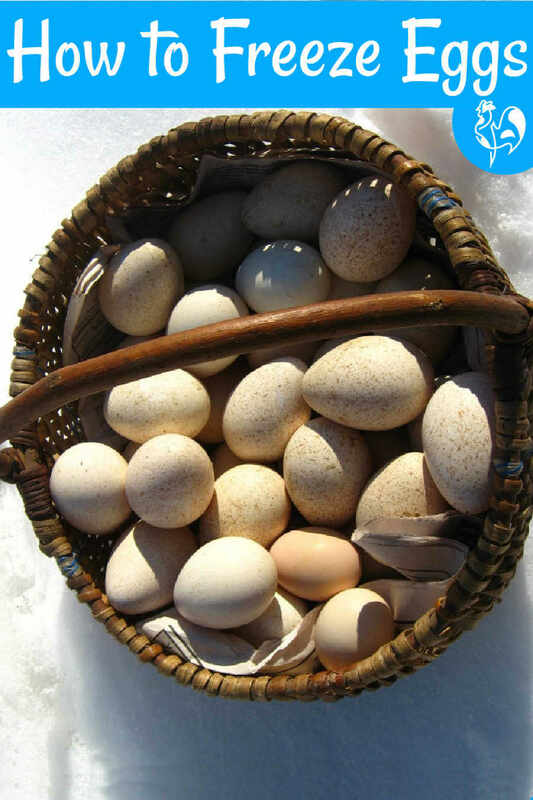 There are three ways of freezing eggs: whole, just the white and just the yolk. Let's deal with freezing the entire egg first. How to freeze whole eggs. Freezing chicken eggs isn't difficult. You can use either an ordinary freezer container and choose to add as many eggs as you like. A more convenient way, though, is to store them as separate eggs. That way, when you come to defrost them you know exactly how much frozen solution equals one egg. The number of cubes one egg takes will vary according to the size of your eggs and freezer tray. Start with just one. Break it into a cup and, with a fork, gently beat the white and the yolk together. Do not use an electric whisk or even a hand beater. Use a fork and only beat it gently, just until the white and yolk are combined. If you beat it hard you'll add in too much air, which will make it rubbery when you use it later. Now pour into an ice cube tray. Be careful of the white - the chalazae (the stringy bit) tends to pour quickly and can overflow. Make a note of how many cubes equals one egg. Once you've done that, combine as many as you want, fill up the ice cube tray and freeze. When frozen, empty the frozen egg cubes into a freezer bag and label, making clear how many cubes equal one egg. Put into the freezer and you're done! If you regularly use whites alone, you can freeze them separately to the yolk. Separate the white of one egg from the yolk. Don't beat it, just pour into the ice cube tray. 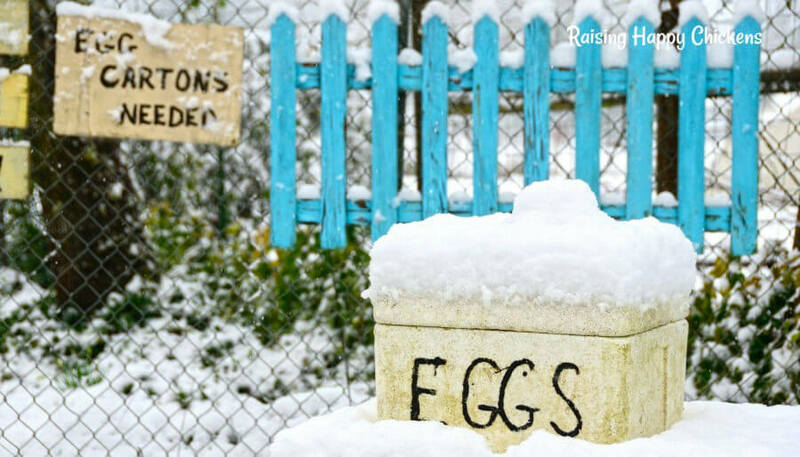 Measure how many blocks one egg takes, then add as many whites as you want to freeze. There's no need to add anything, just put them into the freezer and, as before, when frozen put into a freezer bag and label. Like whole eggs, whites will last for up to one year in your freezer and can be used as normal in any recipe. 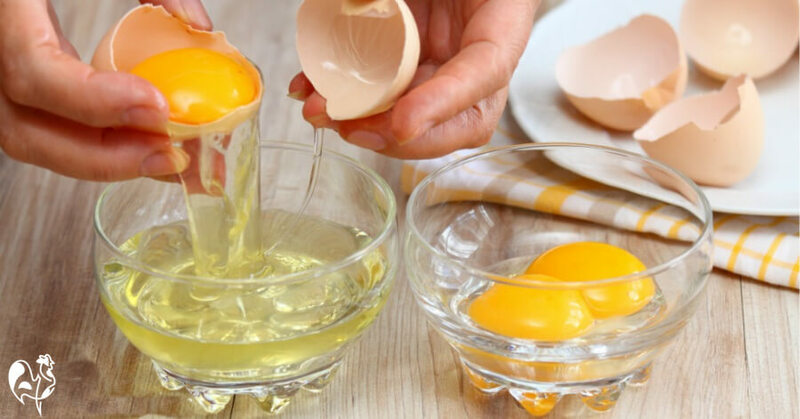 It's possible to freeze the yolk separately too, but it requires a little more attention because if frozen by themselves, yolks tend to go thick and lumpy, and won't be any use for recipes. So before freezing, stir in one half teaspoon of salt per cup of yolks if you'll be using them for savoury dishes. If you're more likely to use them for sweet things, add one tablespoon of sugar per cup of yolks. Then just add to your freezer tray as before. Does freezing cooked eggs work? No. They go watery, hard and rubbery when they're defrosted. Better to freeze them raw. How about freezing them still in the shell? Freezing liquids makes them expand. If you try to freeze them in their shell, the shell will crack - it's as simple as that. Thawing and using frozen eggs. 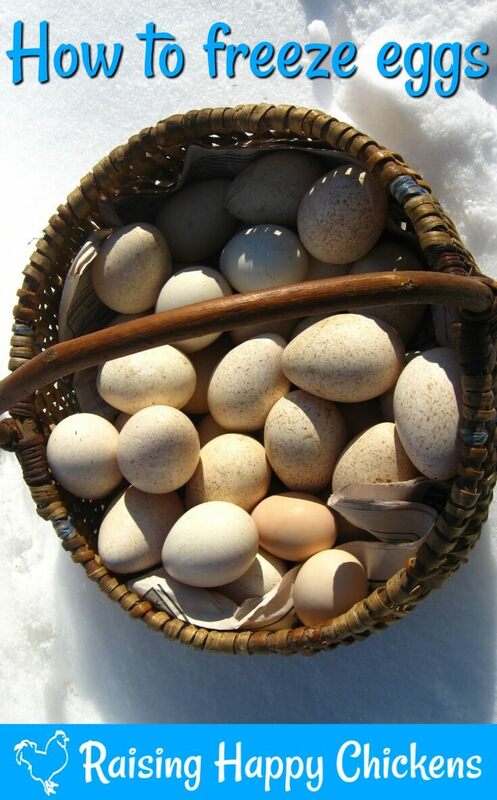 Frozen eggs will keep for up to one year in a freezer. Whether you've frozen them whole or separated, defrost in a refrigerator overnight and use within one day of defrosting. If you've frozen the whites alone, they should be left to stand at room temperature for about 30 minutes if you're planning to use them beaten - they're perfect in meringues, for example. Again, make sure you use them in recipes where they will be thoroughly cooked. Well, you could try standing them in the snow but it's probably easier to use the freezer! Need a good ice cube tray? This is like the one I use for freezing eggs. Why? I like using a tray with a lid because it helps make sure nothing drips out. This lid provides a seal so the egg doesn't drip out, even if you tip it on your way to the freezer. 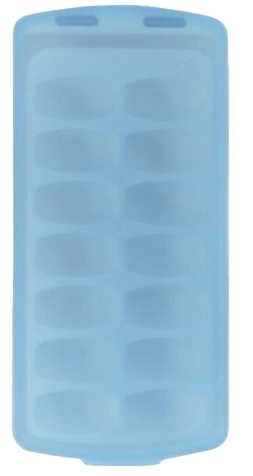 It's also great for storage, so if you want to keep your frozen eggs (or ice cubes!) in the container rather than bagging them, you can stack it in the freezer sideways on - it takes up less room than a bag. This one is an updated version of mine (I've had mine for years!) and it's actually even more convenient because they've now developed the cubes with rounded bottoms, so they slide out of the tray far more easily than the standard square shape. To buy from Amazon, click here or on the pic. 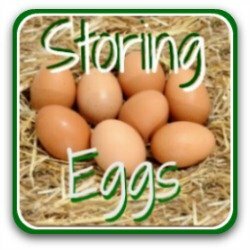 Storing eggs on your kitchen surface? 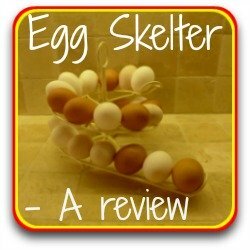 You need an egg skelter! The Egg Skelter is one of my favourite pieces of kitchen equipment. I've had mine now for several years, and it still looks as good as it did the day I bought it. I've also bought these for various friends and relatives over the years, and everyone has loved them. They make a really useful and very unusual Christmas or birthday gift! To see my review and find out where to buy them, click here or on the pic. 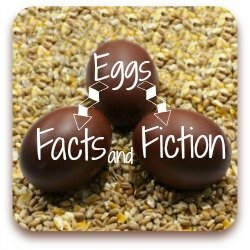 You may be surprised at some of the information I've gathered about eggs. Click on any of these pics to find out more.